Tamilnadu's politics and culture befuddle outside observers. 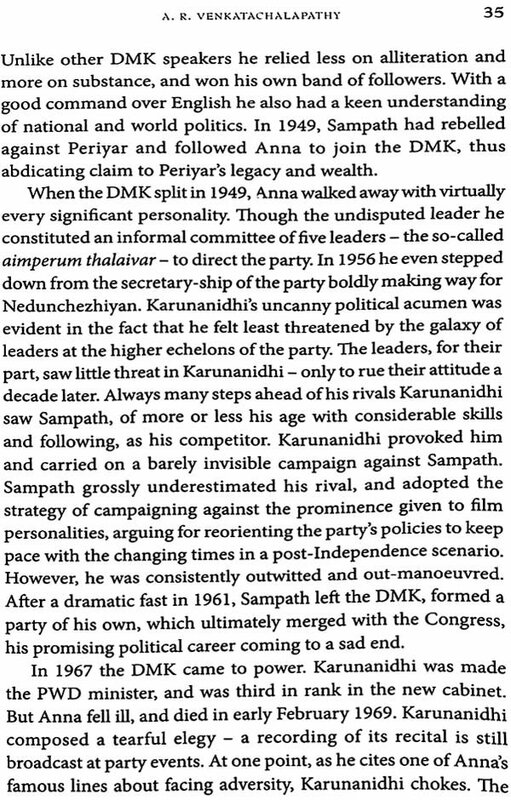 Ruled for half a century by two regional parties — DMK and AIADMK — its politics has been marked by language pride, non-Brahmin movement, caste-based reservation, regionalism, welfare populism, and cinema. Despite the negative coverage it tends to get from outside,Tamilnadu is a developed state scoring high on all human development indicators. In Tamil Characters, noted historian A. R.Venkatachalapathy provides a ringside view of contemporary Tamilnadu beginning with an assessment of political figures such as Periyar and Anna, Karunanidhi and Jayalalithaa, and significant poets, writers and thinkers including Subramania Bharati and lyotheethos Pandithar. The final section discusses contentious issues such as language politics, prohibition, jallikattu and Dalit rights. A.	R. Venkatachalapathy (b. 1967) is a professor at the Madras Institute of Development Studies, Chennai. He studied in Chennai before doing a PhD in history at Jawaharlal Nehru University, New Delhi. Chalapathy has taught at Manonmaniam Sundaranar University, Tirunelveli; the University of Madras; and the University of Chicago. He has held research assignments in Paris, Cambridge, London, and Harvard. He was the Indian Council for Cultural Relations Chair in Indian studies at the National University of Singapore (2011-12). He has published widely on the social, cultural, and intellectual history of colonial Tamilnadu. 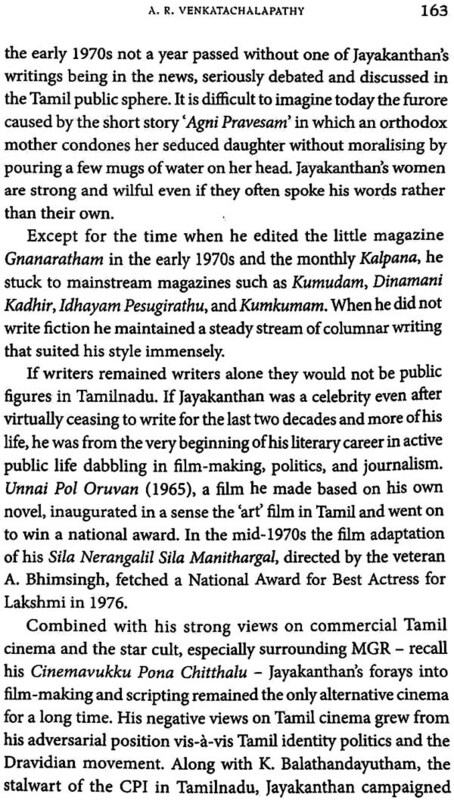 Apart from his writings in English he has written and published extensively in Tamil. His more than thirty books include non-fiction, compilations, scholarly editions and translations. Over the last few years he has been writing in the popular media. He was awarded the VKRV Rao Prize for History in 2007. 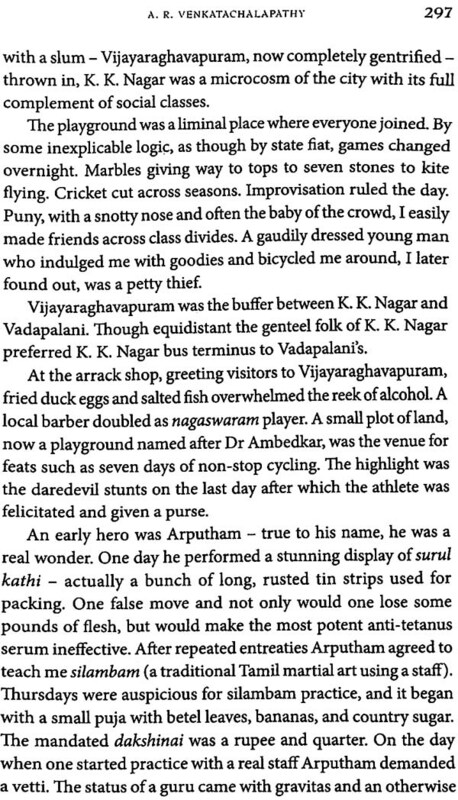 Presently he is working on a biography of Periyar. TAMILNADU POSES A CHALLENGE to common sense. The contours and complexities of its politics and culture often befuddle observers. Media persons from outside Tamilnadu are puzzled when they chase stories from the region. This despite the prodigious volume of international literature that focuses — much to the chagrin of adjacent regions such as Kerala, Andhra, and Karnataka — on matters Tamil. 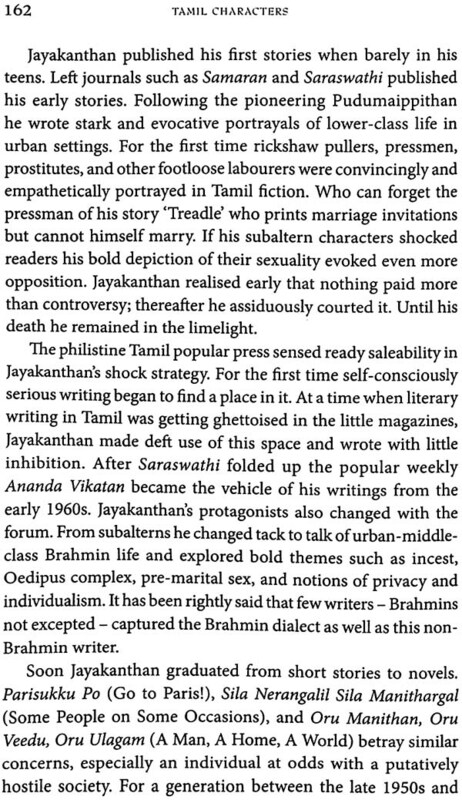 On the one hand is the long history of claims to Tamil distinctness and exceptionalism. The 'South; especially Tamilnadu, has posed problems to the Indian nation as well as to historians. Thomas Trautmann, the distinguished American historian-anthropologist, once observed that, 'The idea of an Indian South that differs in kinship and language is a very old one The south of India therefore has always demanded a separate history. Tamilnadu has been part of the Indian mainstream, yet maintains its distinctiveness. A party which has ruled the state a good part of the last fifty years had, until not so long ago, a secessionist demand built into its founding constitution. Fringe Tamil nationalist elements always function and attract attention. 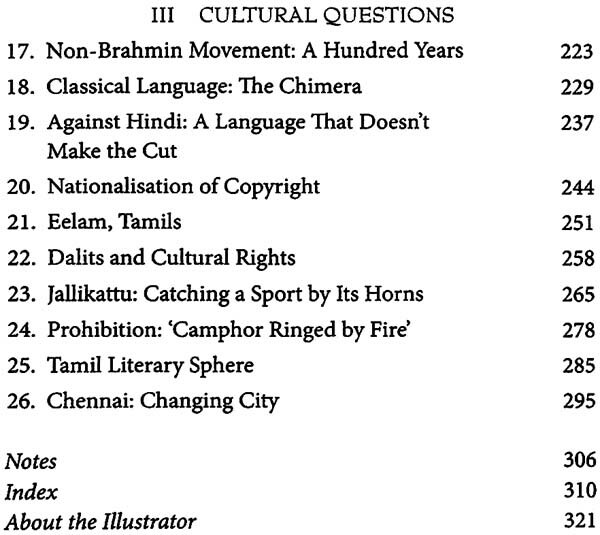 The Tamil ethnic question in the adjoining sovereign state of Sri Lanka question continues to resonate here. 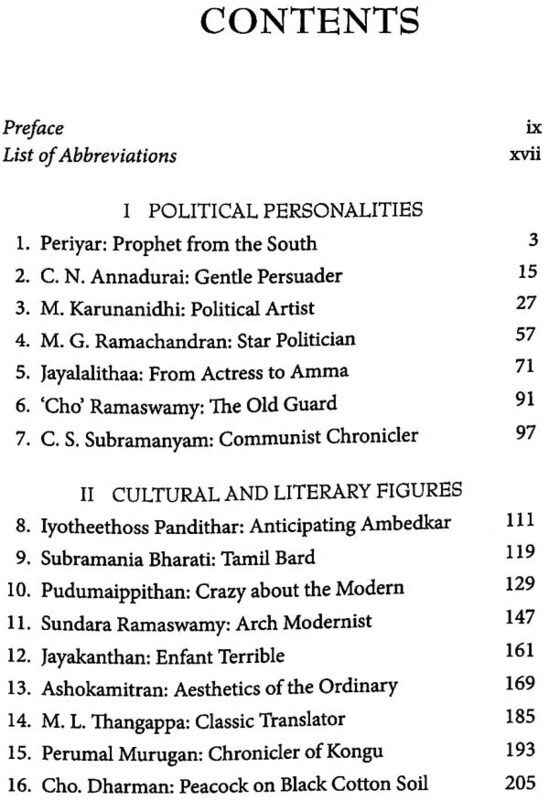 The caste system, marked by the absence of the intermediary Kshatriya and Vaisya varnas, has its own Tamil iteration. With probably the smallest proportion of Brahmins in its population, Tamilnadu is the progenitor of a non-Brahmin movement — over a century old, this movement is still alive. 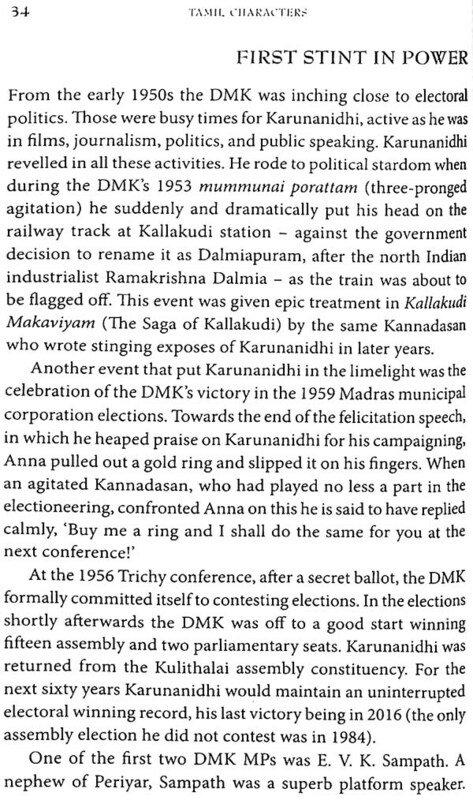 While an organised Dalit movement is of recent origin, two generations before Dr B. R. Ambedkar, the Tamil region produced an intellectual who argued that the 'Untouchables' were the original Buddhists, and that their conviction resulted in discrimination. Systematic caste-based reservations in employment and education were introduced in Tamilnadu nearly a century ago, while most of India is still struggling to reconcile itself to such positive discrimination and affirmative action. Dravidian kinship remains one of the world's distinct kinship systems. If couples from the same gotra can be hounded in the cow belt, marriages between cross cousins, and between maternal uncles and nieces are still preferred in many parts of Tamilnadu. Language occupies a central place in the eponymous tract. Linguistically, Tamil is part of a family of languages, Dravidian, which is distinct from the Sanskrit-derived Indo-Aryan family. Tamil has asserted independence from Sanskrit over the centuries; possibly Tamil is the only language where a purist movement has succeeded to a great extent. Since the turn of the twentieth century a demand to recognise Tamil as a classical language has been articulated; and this recognition was won through governmental fiat for the first time anywhere in the world. The region has witnessed two major anti-Hindi agitations - against the compulsory study of Hindi in schools (1937-9) and against the constitutional recognition of Hindi as the sole official language of the Indian Union (1964-5) -and the underlying sentiment shows little signs of diminishing. Devoted to language, scores of youths have given up their lives in the cause of language, tragically burning themselves to death. Across the towns of Tamilnadu one can see statues of a bearded old man with the words 'There is no God' inscribed on the pedestal. Yet the Bhakti movement, which originated here more than a millennium ago and transformed the Hindu religion across the subcontinent, continues to thrive. There may not be a single neighbourhood in Chennai which does not have a Pillaiyar (or Gangai or some other Amman) Koil Street — much to the confusion of postal delivery staff and courier boys. Tamil temple architecture, or Dravidian as it is called, is arguably Tamil's greatest contribution to world culture, its influence permeating South East Asia. Embedded in the social structure, the massive edifices of stone are the site of struggle, as once-marginalised communities stake claim to cultural rights. For nearly a hundred years now, Hindu temples have been administered by a secular state. Cultural issues obtain great purchase in Tamilnadu. At the time of Independence, through great public pressure, the state acquired the copyright of the poet Subramania Bharati — a first in the history of global copyright. Barely two years ago hundreds of thousands mobilized on the streets of Tamilnadu to fight for the right to conduct the indigenous bullfight, jallikattu. 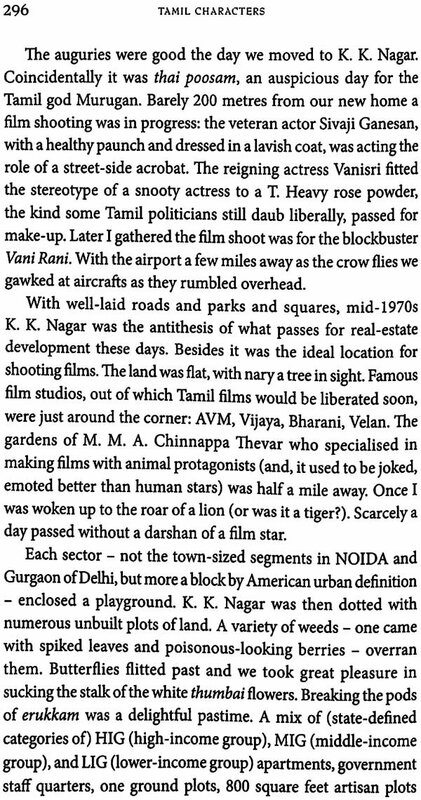 The hold of cinema is a dominant feature of Tamil culture. The Tamil cinema industry is vibrant, and gives Hollywood and Bollywood a run for their money. If a Bollywood star were to walk on the streets of Tamilnadu it is unlikely that the star will receive a second glance. It has been four decades since the composer Ilaiyaraaja practically wiped out Hindi film songs from Tamil popular culture. 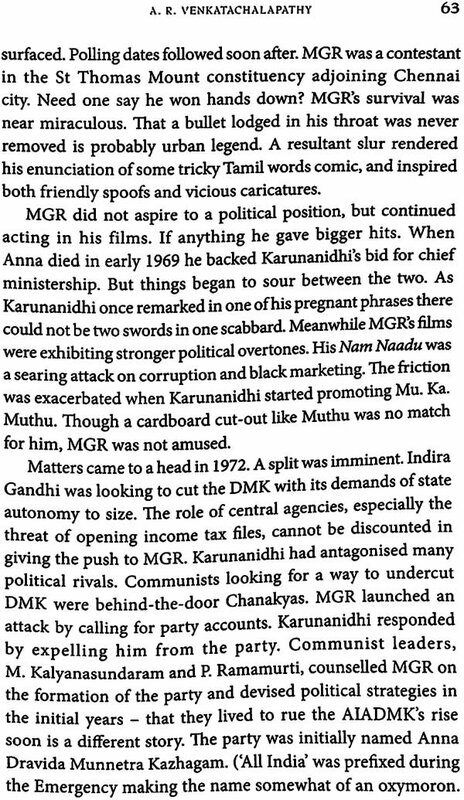 The intertwining of film and politics is most apparent in the fact that the state has been ruled for nearly fifty years by four chief ministers whose popularity was derived in large measure from their film career. As this book goes for printing, at least three — or is it four? — film stars are eyeing the chief minister's chair. Logically speaking, such a state should be a laggard, low down on the development scale. 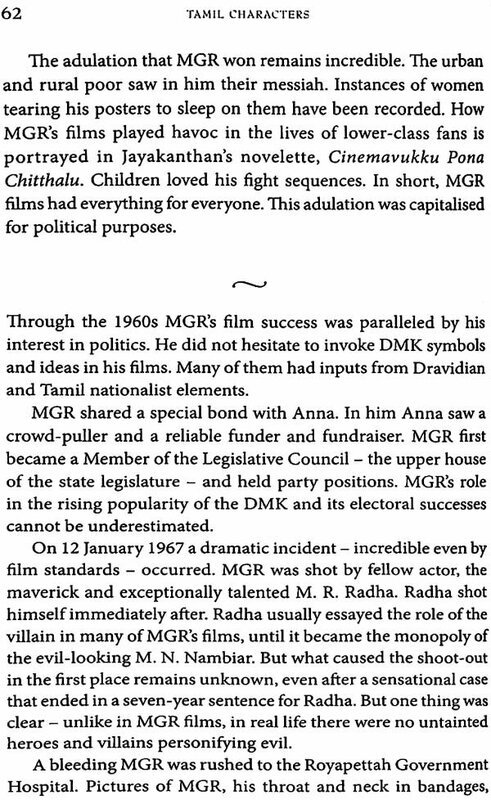 Yet, it is exactly during the time of Dravidian politics that the state has made great strides in development. Jean Dreze and Amartya Sen, in An Uncertain Glory (2013), summarise these achievements in the clearest terms. Describing the 'rapid progress in a relatively short period, they talk of how Tamilnadu, very poor until even the 1960s, now has one of the highest per capita incomes and lowest poverty rates in India. In all human development indicators - education, health, communication, roads and public transport, and civic amenities - Tamilnadu ranks high. All these resulted, they demonstrate, not from political largesse, but through pressure from the bottom, 'an outcome of democratic politics. This book addresses the political issues of these times refracted through the prism of personalities - both political and cultural -and specific cultural issues. This was not planned as a book, but, in a manner of speaking, I absentmindedly ended up writing it. In my intellectual career I have worn two hats: that of a professional historian writing in English, and a Tamil writer producing essays and monographs on cultural history for the general reading public.